E&Minator is a full featured E&M coding app for iOS developed by Healthcare Value, Inc to meet the daily coding needs of physicians. E&Minator is probably the best E&M coding app for iOS on the market. E&Minator includes Risk Based Coding, time based coding, and critical care. These features make this app powerful and easy to use, allowing the determination of an appropriate coding level in less than a minute. This high efficiency app will have you coding correctly in less time than it took to learn how to use Epocrates to check for drug interactions on your iPhone! 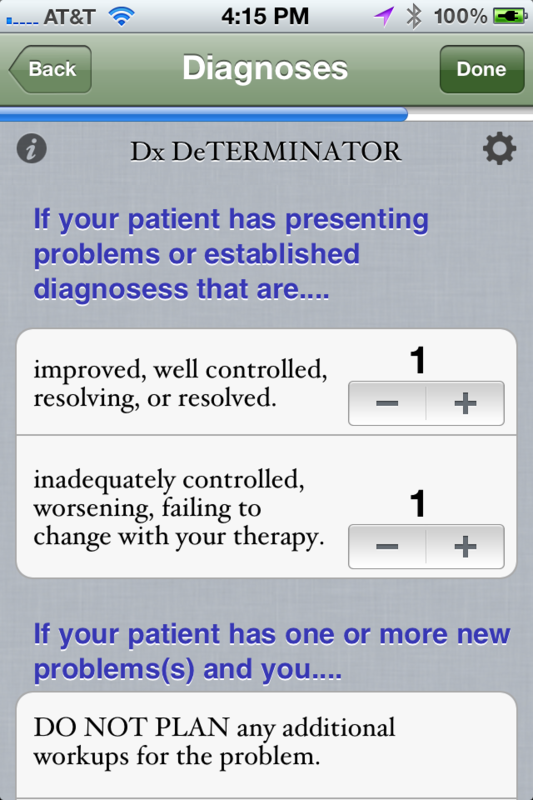 The reviewer used this app to code some 170 inpatient encounters, without any difficulty or identification of any shortcomings in the application. E&Minator is an excellent tool for anyone learning to code for E&M services or who wants to be certain they are coding the most appropriate level for the services they are providing. This app can effectively replace hours of physician coding training, and the knowledge can be applied immediately. Cost effective. Just $34.99 instead of thousands of dollars for coding courses! Thank you for the detailed review and especially for putting E&Minator through the paces for 170 patients to thoroughly test our app. We’ve just submitted our 1.3 version that adds a tutorial to make the learning curve even shorter and we’ve got plans for additional features to bring even more benefit to our users. Sincerely, Your coding cyborg team, Tray and Jerry. We have submitted (today) a "Lite" version to the app store. Time based coding in the lite version will retain all the functionality of the complete E&Minator version, however, location codes will only be functional for estab. home visit patients. The full-bodied version addresses inpatient, and all other outpatient service locations. This release is designed to allow users to see and experience how the robust version works before actually buying the app.